Equip your mobile workers with rugged tablets and notebooks, and you’re equipping them with tools that are ready to work wherever they’re needed. But does that extend to vehicles? They're often the missing link in the fully-rugged work cycle. 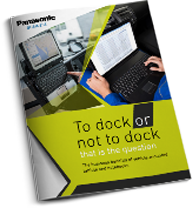 Recent research, commissioned by Panasonic, and carried out by IDC, has shown that only 23% of companies have considered tmounting their rugged tablets in vehicles. Which means they’re missing out on the many advantages of keeping mobile workers connected to the data and applications wherever they are. of other businesses, take a look at the report now.